. . . from the desk of Jim Condit Jr.
Here’s what we’ve been doing and are now doing to try and help some achieve some breakthroughs against the gathering tyranny being attempted by the hierarchy of the Neo-Cons or Ruling Elite, i.e., the shadow New World Order government, which continues to attempt to emerge in full bloom. 1. Many of you helped me to get up to Iowa for the August 11, 2008 Iowa Straw Poll in Ames, Iowa. I drove with 3 of my children (age 21, 19, and 16) all night to arrive at the WHO AM studios at 8:15 AM for a 9 AM appearance on the Jan Mickelson Show. This is the largest radio show in Iowa, with 30,000 to 50,000 listeners at any one moment. Early in the show, Mickelson brought Bob Schulz of We the People onto the show to announce that we were about to file a federal lawsuit against the SECRET COUNTING of the vote that the IOWA GOP was about to do on the discredited Diebold Machines (the Secretary of State of California had just decertified all major computer systems on August 3, 2007, 5 days earlier, based on a commissioned study done by the University of California). This looked to be a re-run of the secret count pulled against Pat Buchanan in 1995 in the Iowa Straw Poll of that year, a story too long to tell here. Jan Mickelson of WHO AM, the largest radio station in Iowa, let me come on his show in studio at 9 AM on August 8, 2007 to blast out the truth about the abomination of secret computer vote counts being conducted in 49 states of our nation and ½ of New Hampshire. The Iowa GOP went “nuts” that their intended use of discredited Diebold computers for the Iowa Straw Poll three days later was being exposed. Mickelson had also been the host in 1985 on WCKY in Cincinnati, when on the day after the November election that year, the Collier brothers (authors of the book “Votescam”) and I were guests on his show to tell about the women we had filmed at the Board of Elections the night before tweezing votes out of ballots with common household tweezers. You can listen to the Aug 8, 2007 radio show by going to www.votefraud.org and clicking on the link “Video and Audios! Fun . . .” near the top of the home page. 2. The rest of the radio who was a “knock-down, drag out” between myself and Iowa GOP leaders, Chuck Laudner, and Ted Sporer. Both found themselves unable to answer two questions: “Who – what is the name of the PERSON -- who programmed the Diebold computers you’re about to use to process the votes?” Dead silence. None of the Secretaries of State nor any county election leaders know the answer to this question. Diebold and the other 3 big companies won’t tell. Next: “Why is the one non-negotiable with all of you big time Democrats and Republicans that you INSIST on hiding the ballots from the people during and after the count?” A futile attempt at obfuscation was made on this point by the flailing GOP leaders of Iowa. 3. Right after the hour radio show, -- so many irate Iowans called the Iowa GOP headquarters demanding to know why they were using the discredited Diebold machines, that the Iowa GOP made an appeal to the Ron Paul paid staff in Iowa to send out an email asking Ron Paul supporters to quit calling GOP headquarters! The email, sent out by RP paid staff member, Jeff Frazee, to Ron Paul supporters was nasty; it told them to “Stop it”, regarding any more calls to the political thugs at Iowa GOP Headquarters. He also said that the RP paid staff was doing everything they could to insure a fair count, which was a blatant falsehood, as they did nothing but support the Iowa GOP in their unconscionable, secret count of the votes (behind police guard). The Ron Paul paid staff has called our effort to get an open count of the ballots “harmful” to Ron Paul and his campaign from that day until this. Despite GOP leader Ted Sporer yelling at me on the radio show that Ron Paul was a loser and a 1% candidate, the Iowa Ron Paul paid staff took Sporer’s side 100% and told everyone they could influence NOT to help our Vote In Sunshine effort to get an open count, and then, when that failed, they told people not to help us in our efforts to conduct an exit “vote verification” poll, in which, BECAUSE OF THE SECRET COUNT, voters were asked to fill out an signed statement of who they just voted for. While I’ve waited a long time to say it because I needed to establish an unmistakable pattern, the Ron Paul paid staff is RIDDLED with Neo-Con plants and/or career opportunists who are more interested in staying in good with the Neo-Con thugs running the RNC, New York City, and Washington DC, -- than they are in winning the election for Ron Paul and America. More on this below. 4. The next few days we worked to set up the “Vote in Sunshine” vote verification effort. Since, by Friday, the federal court had refused to intervene, the votes were being counted behind closed doors on Diebold machines, with the ballots always hidden from the public (just like happens at the real elections in 49 of our states, and one half of New Hampshire), we had both vote verification cards AND affidavits for those coming out of the voting buildings to sign. Ted Sporer, who was the GOP thug I squared off with on the radio, was so afraid of the affidavits that he got the campus police to threaten arrest against some of our people if they persisted in the vote verification effort. Some were scared off, but Walter Reddy of Connecticut led a team which were not scared off, and the Iowa GOP thugs backed off. 6. This was a far cry from Congressman Ron Paul himself, who when he landed on Wednesday night said: “This is the beginning of the process. Now is the time to ask questions.” One of our team from California talked to Carol Paul herself, wife of Ron Paul, on the night before the Straw Poll, and Mrs. Paul said she was very worried about the media censorship against her husband, and that they were also very worried about the computer counts. Ron Paul’s son, Rand, came on a national call a few weeks ago and encouraged all of us in our efforts to watch the vote count. He recognized and stated by the end of the national conference call that the “vote count” issue was yet another transparency in government issue. And his comment is right on point. 7. On Friday, August 10, 2007 – one day before the straw poll, 11 of us were in federal court, based on the action filed by Mr. Bob Schulz of “We the People”, on behalf of 11 plaintiffs including myself and 5 Iowans, asking the Judge to force an open count by hand of all the ballots – something that could have been easily done. We even brought the 60 transparent boxes they needed to keep the votes in public view until the voting was done, and until the counting of the vote in full public view could begin. Mr. Schulz and several of us gave a cogent presentation, while the Iowa GOP embarrassed themselves with illogical irrelevancies. But the federal judge declined to throw out the computers. We appealed that night, but the appeals court also refused to throw out the computers on the morning of the Straw Poll. Local press coverage was good in print and on the local TV stations. The young people working as reporters seemed genuinely sympathetic. Even national and international press coverage was good on the WEBSITES of the largest papers, such as the Washington Post and the International Herald Tribune (distributed largely in Europe), as well as Asian papers, -- but, of course, in the USA, the little censors stationed at all big media outlets between the actual reporters and the morning paper that hits peoples’ door steps – removed any reference to our lawsuit or the controversy over “hide the ballots from the people” so-called elections. 8. Between the opposition of the paid Ron Paul Staff in Iowa to the vote verification effort (and all the hundreds of volunteers who thought the campaign paid staff knew best and, therefore, followed their advice), and the threats of arrest against our volunteers from the Iowa State University campus police under the prodding of GOP thug Ted Sporer, we were left with about 14 workers. These workers valiantly got 930 of the 14,500 or so voters in the Straw Poll to sign a voter verification card or an affidavit. 320 or so of these voted for Ron Paul, and about 1/3 of those went to the extra trouble to travel across the street to our “Vote in Sunshine” tents where they signed an affidavit. After a long delay of one hour and twenty minutes (twenty minutes longer than the delay during the absurd secret count of the votes use against Pat Buchanan at the Iowa Straw Poll in1995), the GOP announced that Romney was the winner, with Ron Paul coming in a dismal 5th place, getting only ¼ the votes of Romney. This was in sharp contrast to the landslide first place finishes, and the sometimes strong second finishes – that Ron Paul had been achieving when the votes were counted in the open in straw polls, or when there was one vote - one cell phone, as in the text polls after the FOX debates and the CNBC debate (which Paul won with 75%, to 6% for Romney in second place). While our vote verification effort did not achieve enough numbers to be decisive, the question remains: what would Ron Paul have gotten if all the votes had been counted in the open??? 9. Despite the uphill struggle myself, other team members from across the country, and our teenagers found ourselves in once it became clear that the Ron Paul paid staff was going to oppose the “Vote in Sunshine” vote verification effort, something unexpected and wonderful came out of the Iowa Straw Poll. As suggested above, Walter Reddy of Connecticut, a long time activist in many patriot efforts, put me in touch with Bob Schulz of “We the People” by phone around July 28, 2007, thirteen days before the Iowa Straw Poll. Mr. Schulz and I talked about two hours the first day, and followed up with a few hours of conversation later in the week. Mr. Schulz, who has filed “redress of grievances” lawsuits over the last 29 years, immediately saw how the implications of the “secret vote counts” thoroughly undermines the basis of any free country. So after the effort at the Iowa Straw Poll, a federal lawsuit has now been filed against all 50 states, seeking the banning of all computers, all machines, and all hiding of the ballots from the people in any and all elections. 10. This is called the National Clean Elections Lawsuit (NCEL). 147 plaintiffs from all 50 states have filed the lawsuit. Bob Schulz of “We the People” is the head plaintiff, but all 147 of us are individual pro se plaintiffs. This is the type of unexpected benefit that happens when you hang in there long enough, and thanks to so many of you for helping me hang in. This lawsuit is the very first one, as far as I know, that presents the Ruling Elite with a clear and mutually exclusive alternative. Either the courts will rule that the government has the power to hide the ballots from the people, or that it is unconstitutional for the government to hide the ballots from the people at election time. Clearly, if the courts rule that it is OK for the government to hide the ballots from the people during and after an election, thereby hopelessly breaking the “chain of custody” of the ballots, i.e., the evidence, -- then the Ruling Elite is telling us that we no longer live in the United States of America, under the Constitution, but rather that we are now living under the Communist Shadow Government which hopes to emerge as the New World Order Tyranny. By the way, you can read the text of the NCEL lawsuit at one of the top links on the home page at votefraud.org – and there is literally nothing the courts or the 50 states can coherently answer to this historic lawsuit. For the US Supreme Court has already ruled TWICE, in 1964 and in 1915, that our constitutional right to vote is made up of two parts: a) the right to cast a ballot (which we still do); and b) the right to know that your vote was counted honestly and accurately, --- and this second part is being denied to us at almost all the primaries and caucuses, New Hampshire and the Iowa Caucus excepted, -- and in every state at the general election in November, except for ½ of New Hampshire. 11. How is it possible that so many malefactors are in key positions in the Ron Paul for President Campaign? The key was provided by freelance journalist Melissa Pillsbury-Foster, who is of the famous Pillsbury family. Her writings are at HowTheNeoConsStoleFreedom.blogspot.com. She revealed that the secret power behind the sinister Cato Institute, which poses as Libertarian, and behind the national Libertarian Party, is yet another billionaire NeoCon, Charles Koch (pronounced “Coke”). 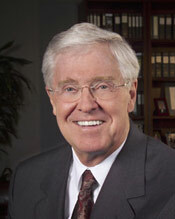 Koch runs Koch Industries, which is a privately run Haliburton that never gets any publicity. Koch has many “guaranteed profit” contracts in Iraq right this minute. This is the NeoCon traitor who funds the so-called Libertarian Cato Insititute (I had never heard of Charles Koch.) Koch is an intimate friend of the Bush family and other top level Democrats, Republicans, Banksters, Zionists, etc. etc. Charles Koch, private owner of Koch Industries, top NeoCon, a billionaire 12 times over, good friend of the Bush Family, and other top N W O Ruling Elites, and NeoCons, founded the sinister Cato Institute in 1977, and took over the national Libertarian Party in 1981. According to journalist Melinda Pillsbury-Foster, it is probably through the “Libertarian-Koch” portal that these quizzical types have infested the national paid staff of the Ron Paul campaign. Anyway, it is apparently through the Koch faction that plants have been placed in the very top Ron Paul campaign staff. I have no question of the integrity and faithfulness of Ron Paul and his family (and I would tell you if I did). But those who have the national Ron Paul Campaign office in their grip, are either plants who are throwing the game – or, at the very least, are DC and NYC types who have come from cushy political jobs, and intend to return to cushy political positions after this 2008 campaign. I will post on my website, www.votefraud.org – a long list of the egregious actions of the paid campaign staff, one of which is running Ron Paul himself around as if he’s 20 years old instead of 72, while REFUSING to use his website, www.RonPaul2008.com as it should be used: as Ron Paul’s own television station. The paid staff also REFUSES to challenge the censorship of Ron Paul by the Big Media, playing along as if everything is OK. And, of course, the paid staff is adamantly opposed, as demonstrated by their actions, to any mention of the fact that 48 of the primary/caucus states are going to hide the ballots from the people in the upcoming “counts.” ALSO, the paid staff is doing NOTHING to watch Ron Paul’s vote count in New Hampshire and Iowa. You may remember that Pat Buchanan won all 3 of the early, relatively verifiable contests in 1996 against Bob Dole, and there is strong evidence suggesting that the Iowa Caucuses were stolen from Pat in the most crass manner possible. Then – after Buchanan won New Hampshire – things moved to South Carolina and the Super Tuesday states – all “counted” by secret computer count – and Dole, we were told, “won” all of these contests by crushing “landslides”, 70% to 30%, 80% to 20%, etc. 12. So now let’s consider the Iowa Caucus and the New Hampshire primary. These are the only two contests in the primary/caucus season that are basically counted IN THE OPEN. In other words, we the people can show up and watch the count. To expand on a point above, I led a team in Dubuque, Iowa in 1996. By the grace of God, we proved absolutely that the Iowa State GOP and Voter News Service (the exit poll arm of ABC, CBS, NBC, CNN, and AP wire – FOX didn’t exist then, but now FOX is part of the cabal) crassly stole 13% of Buchanan’s vote in Dubuque County. This story was carried by Chronicles magazine in November, 1996, and is available on the Home Page of our votefraud.org website. The local people and the local party chairman conducted themselves with perfect honesty. How was Buchanan’s vote stolen? The thugs at the Iowa GOP had directed all 99 of their county chairman to call the vote into Voter News Service in New York City. We saw the sheet directing the county chairman in Dubuque to call NYC, and Senator Charles Grassley later confirmed this astounding fact to Mrs. Lois Pusateri of Dubuque, Iowa in a letter. The criminals at Voter News Service simply adjusted the numbers (for instance, dropping Buchanan from 870 votes in Dubuque County alone to 757 votes) and sent them out worldwide via AP wire, a co-owner of the crooked Voter News Service. These false results were treated as the true results. Weeks of efforts to get the thugs at the Iowa GOP or Voter News Service to correct the falsified Dubuque number – were met with arrogant stone-walling. Did the 5 Big TV Networks and the Iowa GOP cheat Buchanan in the other 98 counties at the Iowa Presidential Caucuses of 1996? Well, no one was watching those other 98 counties – but what do you think? IF Voter News Service stole just an average of 4% from Buchanan in every county – then Buchanan, not Dole, won the Iowa Caucuses of 1996. Also, please note, the theft against Buchanan and the American people in Dubuque, Iowa during the Iowa Caucus of 1996 – shows the mechanism by which all key elections can be warped and stolen by the Ruling Elite running the 5 Big TV Networks and the four Big computer “vote-counting” companies which “count” 96% of the vote in the United States of America since 1988. Of course, when the votes (evidence) are kept SECRET behind police guard, there is no chance to prove anything, --- as we were able to do in Dubuque in 1996, where the Caucus vote was counted in the open. Walter Reddy, mentioned earlier in this letter, has begun LibertyBroadcastNetwork.com – which will carry constant updates on the night of these election contests, as well as get reports from those in the field. It is hoped there will be a constant audio broadcast that night, and maybe even a lot of video. I just sent off $1500 last night to hire the lady who ran Pat Buchanan’s Presidential websites in 2008, the incomparable Linda Muller, -- who will be running our TakeBackAmerica2008.com website in the months ahead. I would like to put at least $5000 advertising on the major AM Radio stations in Iowa and in NH in the next month, so that this battle over the vote can be explained to the public. And we’ll have “who-knows-what-expenses” to bring off everything in trying to watch the vote count. So, if we are fighting you’re fight, please help. We’re already about out of time, so please help immediately if you can, so I can get the ads on as early as possible in December in NH and Iowa. REMEMBER, the Iowa Caucus is January 3rd, and the New Hampshire Primary is January 8. Quite frankly, humanly speaking, we are again engaged in desperate efforts, fighting with squirt guns against the New World Orders’ nukes -- in this propaganda war. HOWEVER, I believe, and have seen over and over again, that when we take a small step, God takes a giant step. Perhaps this is on the principle that “God helps those who help themselves.” I am sorry that the financial burden still seems to fall on such a few of you valiant souls. We have raised just under $4000 by internet efforts, and we have a goal of $15,000 to bring off this effort. Of course, if we raised $50,000 we could make a much bigger impact. And, on matter what, I will continue on until November 2008 trying to do my part to expose and defeat the anti-Christ and anti-American forces which are ravaging our beloved country, and our beloved children and grandchildren’s generation. And I am sorry that so many well known voices that could help us --- still choose to remain silent on so many fronts. But that’s the way it still is, -- so let us proceed like men and women. I believe and know that sometimes a pebble starts rolling at just the right time to start an avalanche. 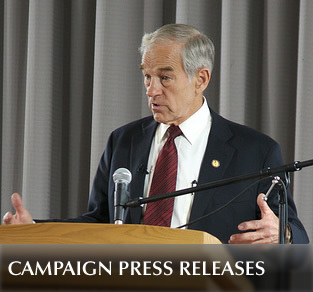 There are millions of young people who have risen against the Media-Blackout to support Ron Paul. They are ready to hear these truths. If you want to help me put on the radio ads, you must donate to: Jim Condit Jr. for Congress 2008, PO Box 11555, Cincinnati, Ohio 45211. If you would rather not show up in the Federal Election Commissions report, you can still help the vote count WATCHING efforts in Iowa and NH by mailing to: Network America, PO Box 11339, Cincinnati, Ohio 45211. You can also mail to the same address if you want to send a check to me and mark “gift”, which up to $10,000 requires no paper work on either side. I promise every penny will go into the fight. Thanks to those of you have already sent help and are praying.